Don't Give Up on your Challenging Dog! 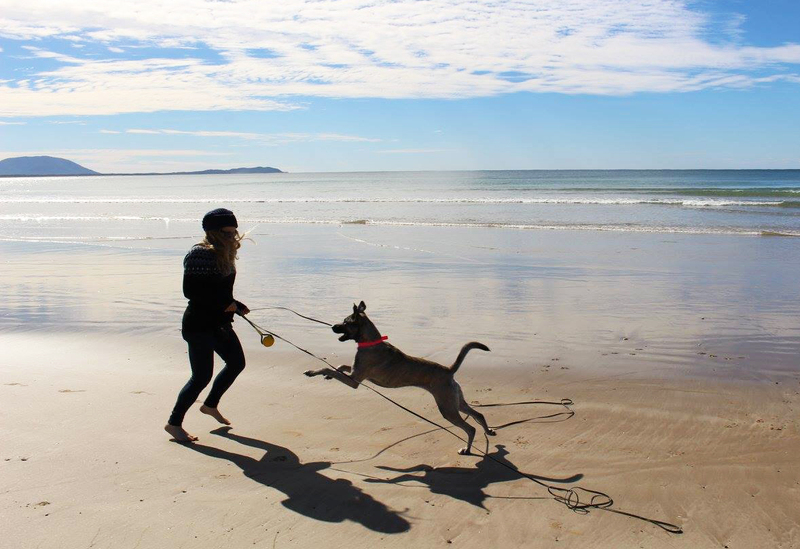 "If you were to ask my family what a pivotal moment in our lives was, they would agree that it was the arrival of our dog, Luna" confides Birdy O'Sheedy from Paws in Life Coaching. 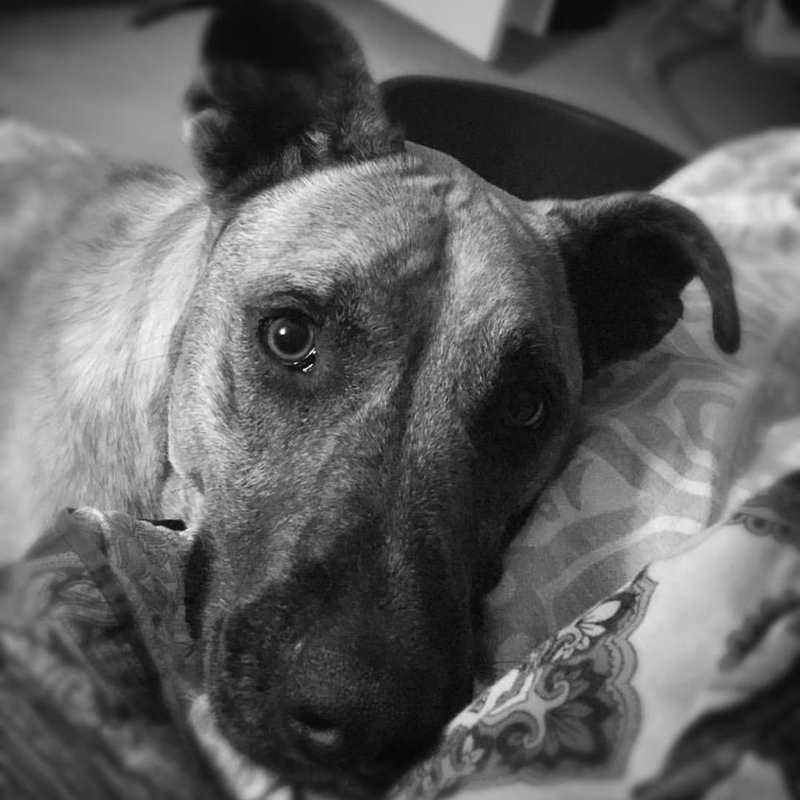 "Luna has a heart of gold, gives the best cuddles and is the most loyal companion you could wish for. We adore her and couldn’t imagine a life without her. However, let me tell you, there was a time in our lives when I considered giving up, and was even dreaming of a life without her. I’m ashamed to say it, but it’s the truth. Why? Because she did my head in! She destroyed our home, due to her severe separation anxiety, she had food allergies and incontinence issues, and taking her for a walk felt like a special ops operation as she was very reactive towards other dogs. 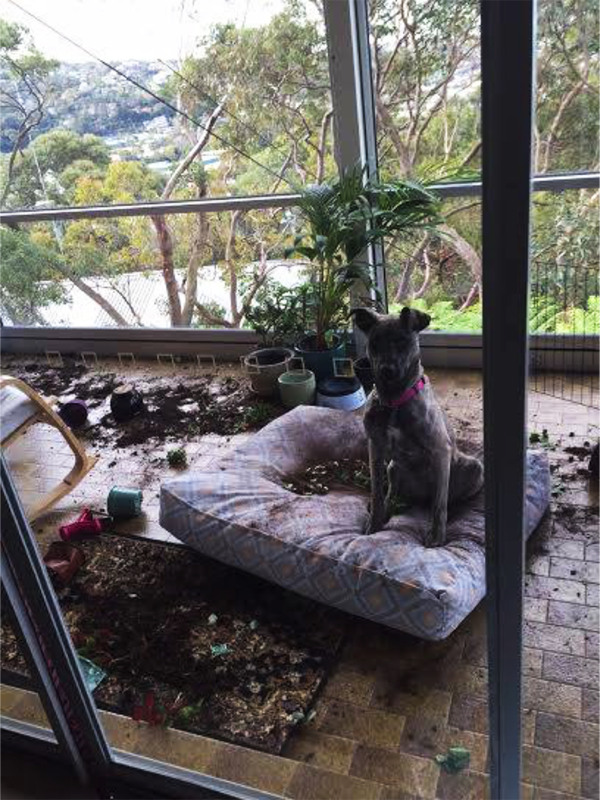 And after our neighbours house burned down, she also became reactive to humans! We were her third home, and for her to stay in our home we had to go through blood, sweat and tears in our behaviour modification training. Looking back two and a half years later, I realise that this dog taught me more in life than anyone else. And that means something, since I’m a clinical psychologist and professional dog nerd, who considers herself a workshop and self-development junkie. So why do I make such a bold statement, that owners of challenging dogs need to be BRAVE? You might have heard the saying, “You don’t get the dog you want, you get the dog that you need.” When my friend said this the first time, I rolled my eyes and walked away. However, there was a point in our behaviour modification training where I was the problem, not the dog, and it took a lot of courage and bravery to work on myself. I was holding Luna back from improving. She was happy to let go of all the difficult times and be in the present moment, but my difficult thoughts and anxiety stopped us from progressing. I started to avoid going with her on walks, as I was paranoid and very anxious of running into an off-leash dog. I was miserable, and became very jealous of other dog owners and their “perfect” dogs. This wasn’t the life I had signed up for when I got a dog, and I resented Luna at the time. I cried a lot, and at one point even considered re-homing her. Thankfully one day after a long conversation with a work colleague, the penny finally dropped: I needed to work on myself, before I could take Luna to the next level in our training. 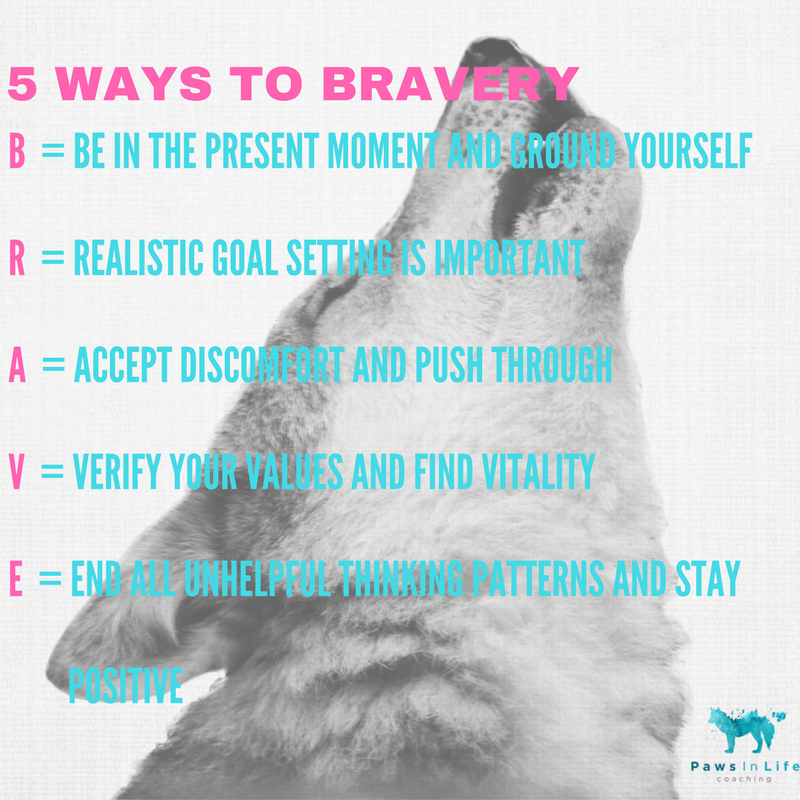 The journey with Luna had triggered some deep unhelpful beliefs and coping mechanisms in me, and I needed to work on them before I could help Luna. Why hadn’t I thought of this before? And that’s when the PACT model was born. It is designed to help the human at the end of the lead. I called it PACT, because every dog owner (consciously or unconsciously) makes a pact with their dog when they enter a relationship with it. The model doesn’t replace traditional dog training, but is viewed as an addition to help the dog owner. The PACT model is based on an evidence-based psychological framework, called “Acceptance and Commitment Therapy” (ACT) Steven C. Hayes, Kelly G. Wilson, and Kirk Strosahl founded ACT in the 1980s, using cognitive-behavioural techniques and interventions. of what gives their life meaning and is important to them. 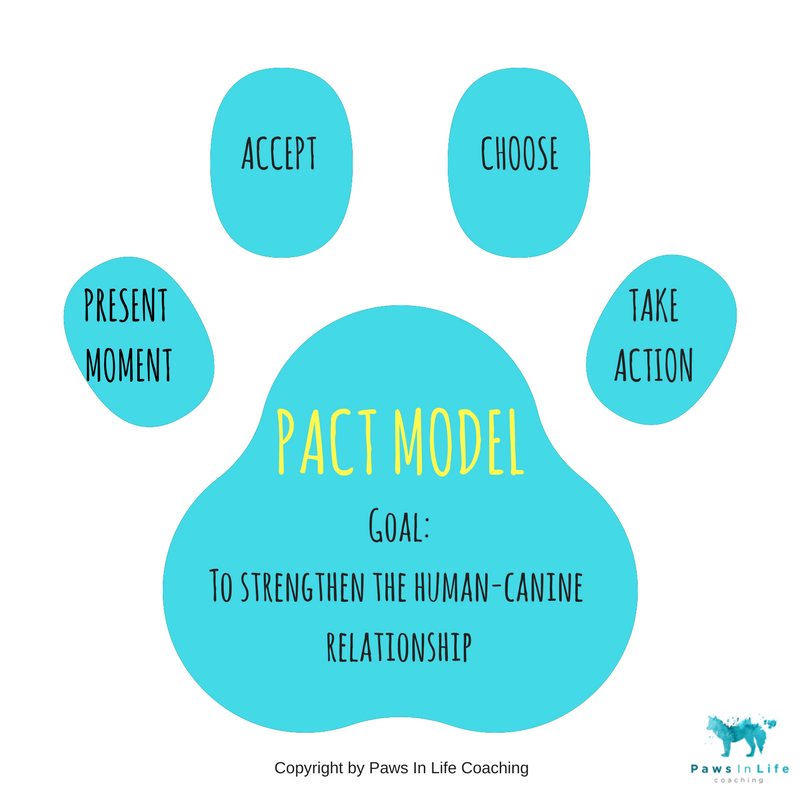 As the PACT model is quite complex, and requires a few sessions to understand it, I’ve created this short formula especially designed for dog owners. I called it the B.R.A.V.E formula for everyday training sessions. I highly recommend using mindfulness techniques, to help you stay present in your training session. Mindfulness is about training yourself to pay attention in a specific way. When a person is mindful they focus on the present moment, and try not to think about anything that occurred in the past, or that might happen in the future. Purposefully concentrate on what is happening around you and try to be open-minded and curious about things you notice (avoid labelling things as ‘good’ or ‘bad’). I also encourage you to set goals that are really tailored to you and your dog’s needs. For instance, if you have a leash-reactive dog, taking your dog for a long walk from point A to B skips a lot of training steps in some cases. So make sure you go back to basics, ensuring you and your dog are a team who can communicate well and respectfully with each other. Have fun with each other and enjoy the things you are good at (e.g. Luna and I are experts in cuddling and love playing tug together). 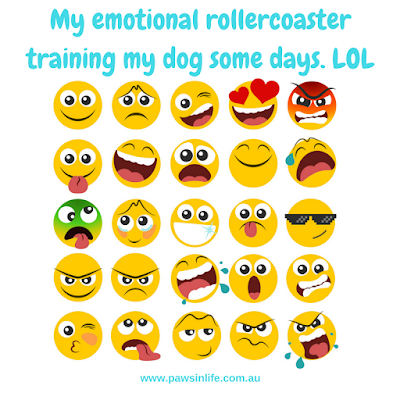 Whilst you are engaging in a behaviour modification program with you dog, it is important to accept, open up and make room for painful feelings, sensations, urges and emotions that go hand-in-hand with having to overcome challenges. It is important to know what your values are. Values give your life purpose and meaning, as they are like your moral compass. So remembering why you got a dog as a companion, think how you would like to manage difficult situations, and what type of person you would like to be when life is tricky. Moreover, make sure that you keep a positive outlook, celebrate achievements and see an opportunity for personal growth in overcoming challenges. And, if you find you are struggling, please reach out. Are you curious to find out how this looks in real life? Well, then enjoy Helen's story. 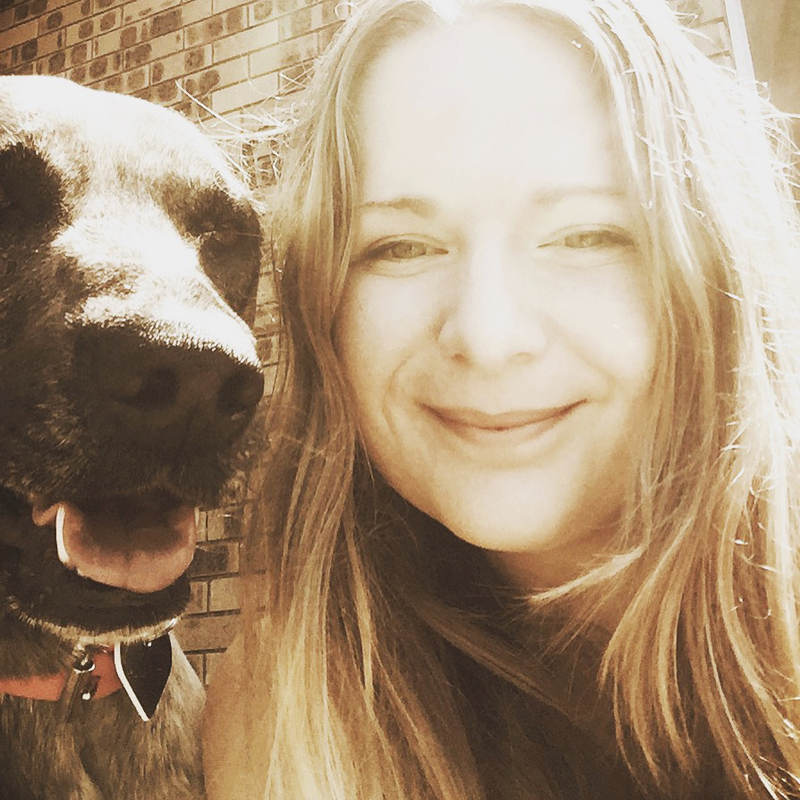 "Sometimes life will give you a dog that teaches you things you didn’t realise you needed, and having someone like Birdy can help you navigate your way through the people end of the leash as well as the canine end. How did I meet Birdy? 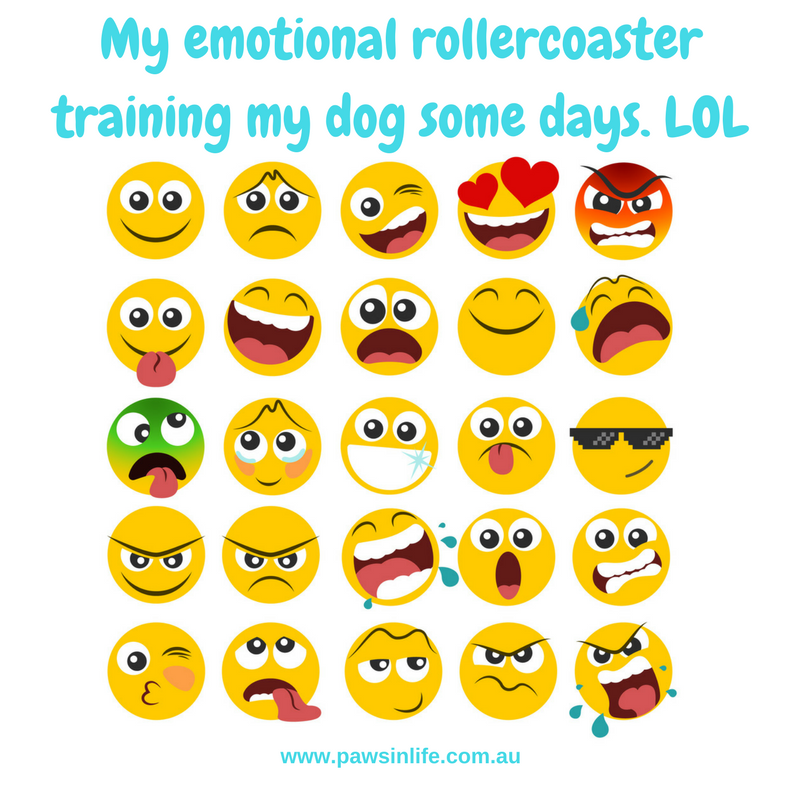 I’d been working with our local trainer, Katrina Diem from Think Canine Training & Behaviour in Toowomba, and also with Sharonika Williamson from Clear Canine in Brisbane, to help my rescue dog Sammy’s severe reactivity. 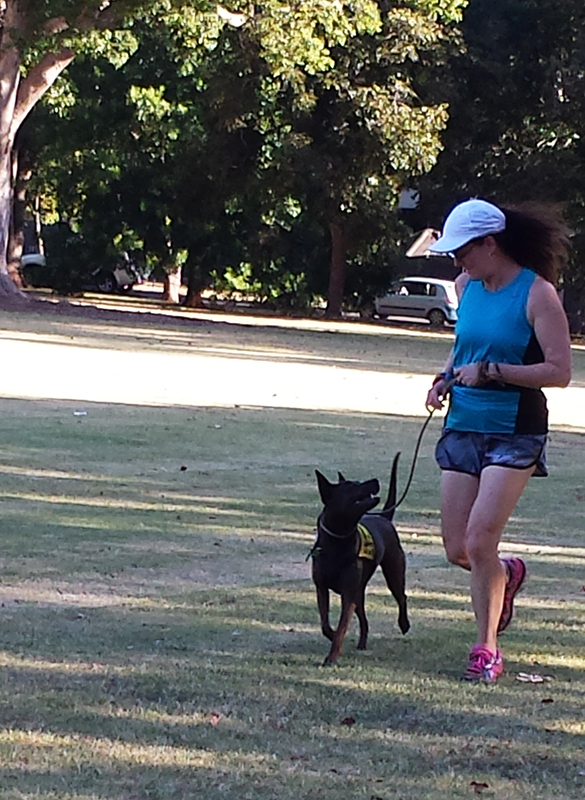 There was great improvement in Sammy’s reactivity and these two trainers taught us a lot. However, there was still an issue at the other end of the leash and this was evident at the board and train changeover with Sharonika. It was an uncomfortable feeling realising I was part of the problem. While Sammy’s trainers tried to help me at my end of the leash, I was still struggling with being relaxed and trusting Sammy. One day Katrina mentioned Birdy’s Bravery Workshop and we haven’t looked back since. After the workshop I also signed up for some one-on-one coaching. What did I get out of the post-workshop sessions? After the workshop, Birdy and I worked on the PACT Model, which is a more in-depth version of the BRAVE formula. This has opened up a new world of feelings and emotions. It was really tough at first; still tough, but I’m learning! It would appear that every time I went out, I was carrying a number of additional leashes around with me, not just Sammy’s leash. For instance, hypervigilance about the environment, catastrophizing and thinking about past events were constant walking companions. I realised that because of these leashes, I was not fully present with Sammy, and all Sammy wanted was to be with me and I wasn’t fully there for her. Acknowledging this was a start. We worked on interventions to address the issues, including working within both Sammy’s and my thresholds. I needed to manage my past negative experiences, unfairness, and dealing with irresponsible dog owners. We’ve also talked through interventions with the ‘accept’ part of the model. For example, I can’t control the environment: life happens! I realised that I needed to accept that I still have a buddy in Sammy, just not the buddy dog that I hoped for when we got Sammy. What I hadn’t realised was that my self-esteem had taken a knock over this period. It appeared that I had little resilience to recover from life experiences, including Sammy sessions that didn’t go to plan. While I thought we were doing great with engagement, it would appear that Sammy and I hadn’t learnt to be part of a team. Birdy provided me with some resources to help me work on my self-esteem and we’ve been following up at our sessions. Learning to ‘accept’ that some days will not go as planned and being able to move on was a big thing. Also, it’s okay to stuff up; life isn’t perfect and sometimes neither are sessions with your dogs. I’m learning to be kinder to myself and lower my expectations. I know that I work hard at everything but as Sammy was not a work project, I guess I worked even harder to try to help her, and was probably not as kind as I could be to myself. Learning to be more mindful and kinder to myself was easier said than done, but I’m learning. This also comes back to accepting various aspects of life, life with Sammy, and the universe. Another shocking realisation was that, even though we love Sammy and I know Sammy loves us, our relationship was rocky. We could do engagement exercises quite successfully, but sometimes we didn’t have Sammy’s engagement. It appeared that trust on both our sides was not there. Off-leash dogs had attacked Sammy, so her trust was not there yet, and on the human side with all the leashes I was carrying, my trust in Sammy was not there. We really needed to strengthen the dog/human relationship. This is where Birdy also helped us with some mindful dog/human exercises. What happened after these sessions? I’m now a much happier person (didn’t know this was possible!) and am learning to be kinder to myself and building resilience when there is a reaction, things don’t go to plan or we lose engagement. I’m learning to accept that Sammy is not the dog that I’d hoped for; I can’t control the environment but Sammy is still my buddy and also my teacher. Sammy is teaching me the simpler things in life - in her little reactive way- to slow down, patience, resilience and just being present is okay. I've learnt that Sammy is always communicating with me, and I'm still learning how to listen. It's not all about thresholds but just being present, slowing down, accepting Sammy for the beautiful girl she is and learning to be kinder to myself. The benefits of these sessions are that you learn so much about yourself and how past and present things can affect the relationship with your dog. Building the human/dog relationship is the most important thing you can do with your dog. This takes time, and don’t think you can make it part of a schedule or a project plan. 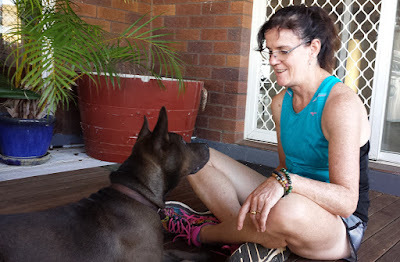 Listen and just spend time with your dog, engage with them. Be kind to yourself and invest in your PACT model. Birdy (Birgit) O'Sheedy is a clinical psychologist, dog-nerd and life coach who runs Paws in Life Coaching in Sydney. She has completed the NDTF (National Dog Trainers Federation) course with a focus on companion animals. 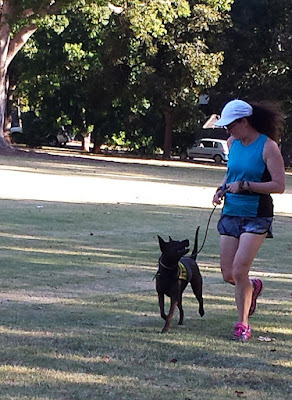 Her strength as a coach is to help you deepen your bond with your dog and to improve your overall wellbeing and mind space. 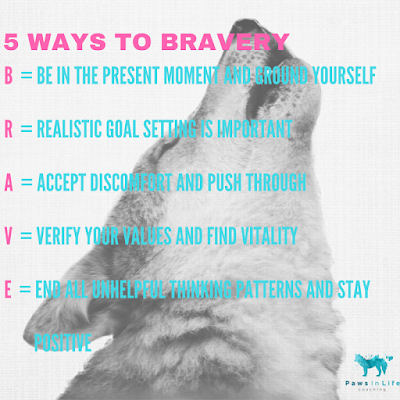 If you want to get a free grounding exercise to help you cope with your nerves on your walks and enjoy them again, sign up here for the free Bravery Newsletter and this innovative exercise will land in your inbox.